Conceptual art may have begun with a toilet submitted for a Paris exhibition by Marcel Duchamp but humour has not been a quality often pursued by his predecessors. 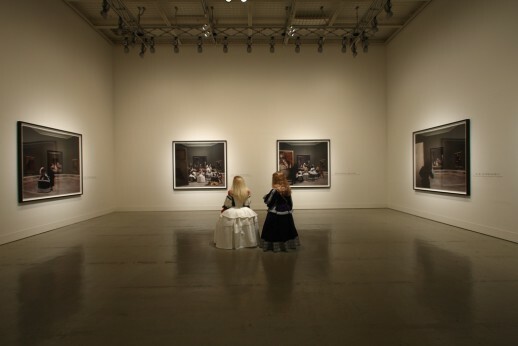 Self-proclaimed ‘entertainer’ Yasumasa Morimura, however, is a notable exception. Since 1985, the Osaka-born artist has been re-creating art history with himself as the subject, his face appearing like a ghostly apparition in the work of artists ranging from Johannes Vermeer to Frida Kahlo, via Francisco Goya and Edward Manet. Many of his adaptions are of iconic works, such as his face on the heads of Van Gogh’s Sunflowers or his reshoot of Alfred Eisenstaedt’s V-J Day in Times Square. He plays with the assumed familiarity of images and provokes a reaction in the viewer that can be powerful and instantaneous and therefore almost discouraging of further contemplation and analysis. When he engages with less recognisable works, however, as is the case with his latest Tokyo exhibition, we are encouraged to look deeper into the relationship between the intentions of the original artist and the nature of Morimura’s response. The three month show at Ginza’s Shinseido Gallery is concerned with Diego Velasquez’s Las Meninas, not one of art history’s most widely recognisable works but probably one of its most critically analysed. Las Meninas (usually translated as The Maids of Honour) is a painting of complex visual layers and tiers of hierarchy relating to the 17th century Spanish royal household. It is unusually conceptual for its time, given that it depicts a royal portrait from the perspective of the sitters, King Philip IV and Queen Mariana, who appear only as blurry reflections in a mirror. The visible subjects include the princess, Doña Margarita María, her maids of honour alongside other royal servants, and the artist Velasquez himself who stands by an easel in the foreground of the composition. Morimura arranges his first eight works as a narrative (or as he describes it, ‘A one man drama, in eight acts’), depicting his signature brand of fine art photo-bombing. 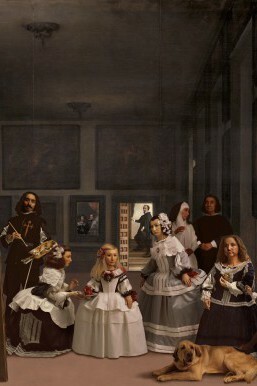 The first image, entitled Kneeling before Velazquez’s Casket (2013), shows Las Meninas where it hangs in Madrid’s Museo Nacional del Prado. In the next, Finding a Tiny Waver within Silence (2013), Morimura stands before the painting in regular clothes as if a gallery goer, but on closer inspection we see his image reflected in the mirror, the place previously occupied by the king and queen. As the photographic narrative continues, Morimura appears in a doorway at the back of the painting, then begins to occupy other subjects in the composition including the princess, her maids and courtesans, Velasquez and then the figures of nearby paintings in the Madrid gallery. The series goes beyond re-composition, treating Velasquez’s painting not as a finished work but as a process. Morimura’s work extends the realities and visual layers of the original, moving the subjects out of the painting entirely and into the gallery space, then even into other paintings. He saw Velasquez’s painting as something that could be reshaped or evolved over time as opposed to a finished article that couldn’t be touched. The Las Meninas that we took to be the final outcome of artistic journey is represented as just one stage of an ongoing process of representation. A further attraction of this particular work to Morimura may have been the court painter Velasquez’s decision to include himself in the painting alongside subjects ranging from the royal heir to the royal dog. The great painter was surely boldly indicating his perceived place in the hierarchy of this household, but in Morimura’s work this structure is abolished entirely. By the seventh photograph of his narrative, all characters have the same face, his, be they princess or servant. In the eighth and final photograph in the narrative, all characters in Las Meninas and in nearby paintings in the gallery have been removed and only the canine subjects remain. It is a rare image in the Morimura oeuvre in that he doesn’t feature in it. It may have served as a fitting goodbye were he considering retirement, but as his last major exhibition, “Requiem for the 20th Century”, only covered art history up to the 1970s, there is still work for Morimura to do. It is surely only a matter of time before we see a shark suspended in formaldehyde with a face that looks oddly familiar.